This is a two minute film that introduces the work of the Dr. Sheldrick Wildlife Trust in the rescue and hand-rearing of orphaned elephants, so that they might ultimately enjoy a life back in the wild when grown. Please share. The David Sheldrick Wildlife Trust :: Crowdrise from Village Beat on Vimeo. All year Dave and I have been on a rather single-minded campaign to raise money so we could adopt/foster an elephant for my sister’s family. All year I have warned anyone who is still around to listen – no prezzies, no anything for anybody not even kids. Mean auntie. All present money was put in our ‘elephant collection’ jar along with money raised from recycling bottles, extra birthday money and money raised from selling things. When my sister recently told me she had found a gift for me I looked at her steely eyed – ‘I SAID NO GIFTS – ELEPHANT MONEY ONLY). “Too late” she said equally steely eyed. So when they arrived the other night for dinner and deposited the gift bag in front of me I announced I would open it tomorrow. “No auntie T, OPEN IT NOW.” said the girls. So I did. And I saw the awesome homemade card that I usually get and treasure. This one had a beautiful baby elephant on it. “Awwwww – he’s so cute.” and I flipped over to the other side where I saw the letters “Chemi Chemi” which means spring. “What a great card.” I said – “But it’s more than a card auntie T”. More than a card. Slow realization. They had adopted an elephant in my name. I have been so single-minded in my determination to foster an elephant for the girls that it never occurred to me that they could do the same for me. Wow, and here he is. So why do I want to do this so badly and why elephants? I want to do it because it started with the simple fact that I’m not a great gift giver and when I buy things I always feel like it’s a big waste of money. And I don’t want to waste money. And increasingly I don’t want to waste time. And like Bill Maher, my deep empathy lies with animals. And within that empathy lies the harsh reality that animals are entirely unprotected and live at the whim of people. I hate that. As I get older I feel myself becoming increasingly more focussed on things that I feel need to get done. To use what I have to make a difference. That’s what I want to do. I’m aware that all wildlife is under attack – gorillas, tigers, lions, bears, polar bears, wolves, whales, dolphins, tuna, rhinos, dogs, cats. But I can’t do it all. So I need to focus. So I’ve focussed on elephants. Gentle, intelligent, social animals that are being hunted to extinction. So baby steps. There are a lot of organizations that are doing a lot of great things to develop awareness and protection for animals. There’s a whole community of amazing people doing great work. The David Sheldrick Wildlife Trust is dedicated to the protection of endangered species – rhinos and elephants.By adopting an elephant and by having an elephant adopted for me I want to help tell their story. So here he is: Chemi Chemi – found at 8 months entirely on his own. He was monitored for half a day and then it was decided that he would be rescued. He was brought to the lodge given water and an attendant for the night. The attendant fed him and spoke soothingly and the little calf settled down. The rescue plane came and took him the next day at dawn. Three Keepers and rescue paraphanalia helped ensure a smooth trip for the little guy. He arrived at the Nursery where he was allowed to meet the 19 other orphaned babies who embraced him immediately. He took to the milk bottle immediately and was taken under the protective wing of Olare the recognized matriach. And that’s the story of how Chemi Chemi was rescued. He was found alone because his family was the victim of poaching, and considering what he had gone through, according to his keepers and attendants, he is doing amazingly well. You can find out about the fostering program right here. 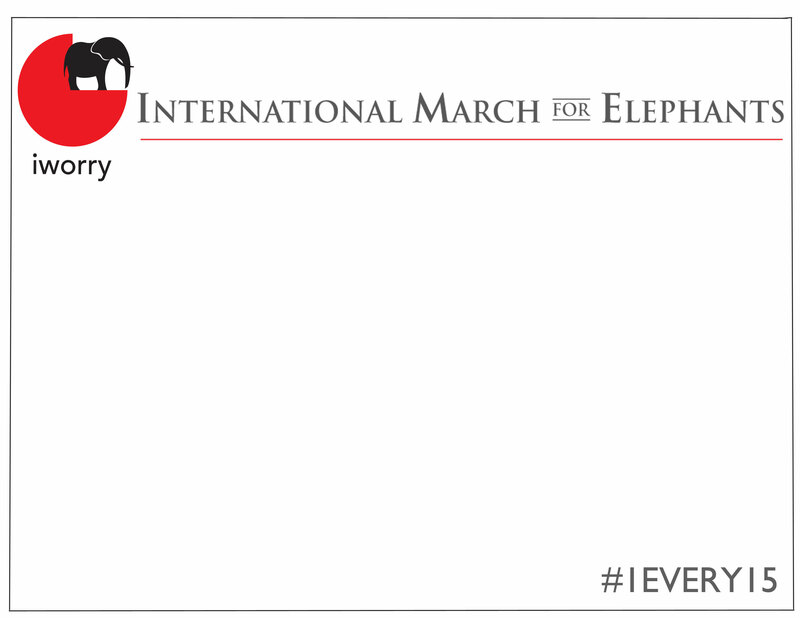 J oin us for the iworry International March for Elephants on Friday October 4th. Last year up to 36,000 elephants were killed for their ivory. 1 life lost every 15 minutes. At the current rate of poaching African Elephants could face extinction in the wild by 2025. Join us as we peacefully march in 15 cities around the world on Friday 4th October. You can also show your support by joining the digital march for elephants. Support the DSWT’s iworry campaign and be a part of a global effort to protect and preserve elephants. The iworry campaign was created by The David Sheldrick Wildlife Trust (DSWT) and exists to raise global awareness to the devastating impact the illegal ivory trade is having on elephant populations. Launched in September 2012, the campaign has attracted worldwide backing calling for a complete ban on the illegal trade in ivory. As a field based organisation, the DSWT works on the front line to protect wildlife and prevent the suffering and killing of wild animals. Recognising the need for greater global awareness of the illegal wildlife trade in ivory, which is claiming the lives of 36,000 elephants annually, the DSWT launched iworry in 2012. The campaign is based on the premise that everyone has a stake in conserving elephants and that we must come together if we are to successfully educate and inform people as to the existence of the illegal ivory trade, the devastating toll it is having on elephant populations and through that, call on governments from around the world to take proactive steps to tackle this illicit trade and save elephants. Sharing the evidence of poaching witnessed by DSWT teams in the field, iworry utilises social media, petitions, imagery, the press and public marches to create an awareness of the existence of the ivory trade and its impacts. The loss of elephants in the wild, an iconic, intelligent and social species, would not only make the world a lesser place, it would have serious environmental and economic repercussions. The iworry campaign calls on world governments to make the illicit ivory trade and wildlife crime a priority issue, to make a financial commitment to security enforcement and to impose a complete ban on all ivory sales. The International March for Elephants has been organised by The David Sheldrick Wildlife Trust (DSWT) through their iworry campaign and will be taking place in 15 cities across the globe in the single largest demonstration of awareness for the species. The ivory trade is an international problem and one which must be recognized by Governments worldwide if we are to see any changes. Join your local city March and stand in solidarity with elephants. The peaceful marches will be concluding at Government Buildings where we will hand over a letter carrying the voice of thousands of people, calling for stricter penalties and urgent global change. Email us to register if you are not a Facebook user. To make it clear exactly what we are marching for on Friday 4th October, we have produced an Official DSWT Elephant Mask for you to print off and wear to show your support. Please see here for a step-by-step on how to secure your Official DSWT Elephant Mask. We do not condone any offensive text and/or imagery on any placards. This is a peaceful march and all aspects will reflect this.